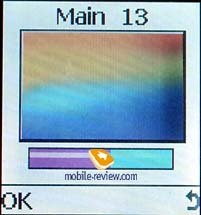 Samsung is going to set new standards and equip all phones with color screen, even the handsets, which cost about 150 USD. It’s more interesting that folder type phones, in producing of which the company has the strongest position, also will be changed. More than half of all models will have 2 color displays. 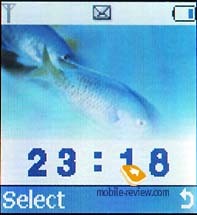 First prototype of a future phone is Samsung S300. It has 256 color STN external display. There are no advantages of such kind of display in a standby mode, but they become obvious while incoming call or a message, or just when a reminder is turned on. Color icons, messages are appeared on the screen, it really looks nice. 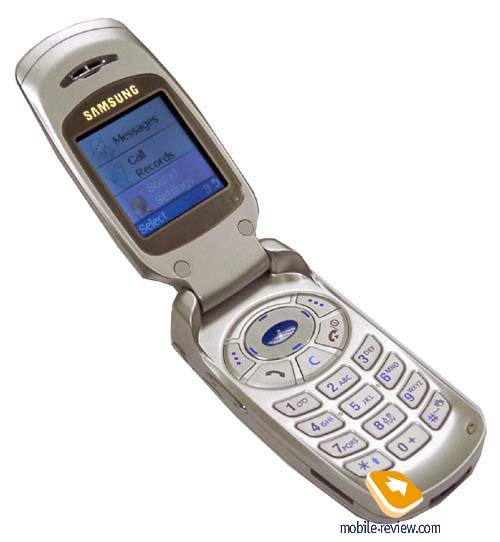 Design of S300 resembles another model of this manufacturer - Samsung A800. It is almost a full copy of an older model, which has absolutely the same dimensions (80х40х20 mm). The battery is also functioned as a rear cover of the phone. 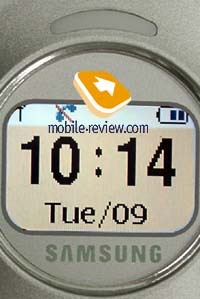 A shape of this cover is different from one, used in Samsung A800. Probably, it was made in order to prevent replacement of batteries. We think that it’s not logical because both phones have a lithium-ion battery of 800 mAh capacity. The phone work about 4 days in case of 10-15 minutes a day and up to 15 minutes of using other application. It’ s a great result for the phone with two screens. The new handset weighs not much, only 76 grams, what allows to wear it everywhere. The main shortcoming of the phone design is rather a long antenna, which sometimes is impeded. The external display is a mirror-like when the phone is closed. Information can’t be read on it, as it is turned off in the standby mode. When backlighting is switched on, you can notice that the display is bright and vibrant. 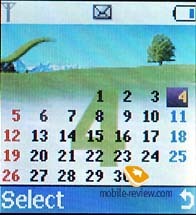 The resolution of the screen is 96x64 pixels, and it contains up to 3 text lines and 1 line with icons. 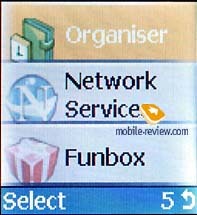 An STN external display of the phone is typical to all displays of this kind and has the same problems. For example, information is not clearly visible on it in a sunny day and you need to peer at it to read text. The other shortcoming is that a backlighting of external display is automatically switched on when you open the phone, what causes excessive energy consumption. An LED is placed above an external display. Traditionally up to 7 colors of indicator are supported and any of them can be assigned to phone numbers. Double volume key is placed on the left-hand side of the phone, lower there is an IR-port. Upper one can find a portable handsfree connector. When you open the phone you can see an internal display, which appeals greatly, because it is 65K UFB-screen. A picture is vivid and rich on this display; it’s pleasing to look at it when backlighting is switched on. There are two backlighting modes in the phone. 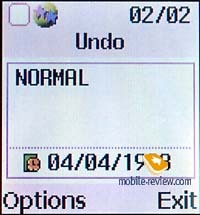 Energy-saving mode is switched on if you don’t work with the phone. The other mode is usual; in this case the backlighting is very bright in contrast to first one, where it is muted to save energy. 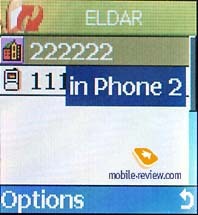 An internal screen has a resolution of 128x128 pixels, what allows to show up to 5 text lines and 2 service lines. An information is highly visible in all lighting conditions. S300 has the same keypad as A800, which at the same time is a small copy of T100. You can see a 4-directional navigation key and three other keys under it (Reject key, Send key, Clear). All keys can be easily pressed. Alphanumerical keys are made of plastic (in A800 they were made of rubber), they are rather large and handy. We estimate the keypad ergonomics as average, not low. Press left soft key and you'll get an access to the menu. 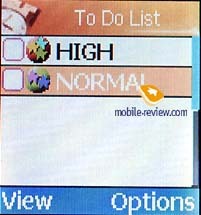 Main menu is made as a list of items and navigation key or volume key help to move between them. There is also a shortcut number navigation. By the way, you can choose one of two variants of the main menu, they differ in graphics. Phonebook. 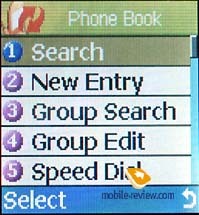 You can enter a phonebook if you press right soft-key in the standby mode. Then you’ll see a list of menu items, first one is “Name search”. 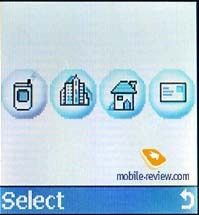 The phone allows to view phone numbers both from SIM-card and phone memories. If you add a contact to a phone memory you can add up to 5 phone numbers (mobile, home, office, fax, other), e-mail and URL to each one. Besides, you can sort all your contacts in caller groups. Up to 5 caller groups are available (and besides, a category “Without group”), you can name them, as you like. Groups are necessary when you send group SMS. There is also a name search in group. 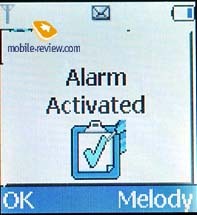 Special ringing tones, pictures and SMS tone can be assigned to some groups. Contacts view is well done. You can see a total list with all phone numbers and choose the necessary one to make a call. Up to 8 phone numbers can be assigned to speed dialing. Totally up to 500 phone numbers (not contacts) can be stored in the phonebook. Messages. The phone supports EMS standard and concatenated messages (up to 918 characters each). 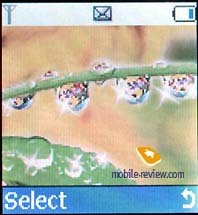 As a result there is a set of small pictures (up to 22) and animated images (up to 24) and a set of melodies, which can be attached to a message. 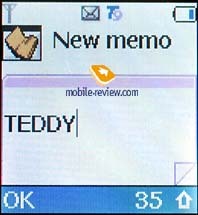 Up to 50 messages can be kept in the phone memory. A new feature to easy text inputting is appeared in the phone. Now when you create a message, you can call a special menu and change a language there. Thus, you can write a message in several languages. Moreover, predictive text input is supported for all menu languages. For example, if you have Russian menu, then you have Russian text input. Call lists. Nothing new is here. There are lists of the last 10 missed, dialed and received calls with time and date indication. Unfortunately, total time of all calls can’t be viewed, though there are separate timers for incoming and outgoing calls. Sound settings. Here you can choose a ringing tone (44 polyphonic melodies and animals voices). The phone supports 40-tones polyphony and a ring is very loud. Very often we are asked what is the difference between 40-tones and 16-tones polyphony. Firstly, 40-tones polyphonic ringing tones sound more natural, secondly, this polyphony allows to reproduce qualitatively a voice. Examples of S300 ringing tones can prove it. Network Service. 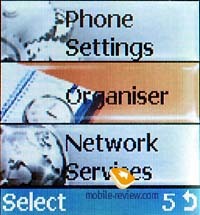 Apart from usual network settings the phone allows a user to choose manually a current band (GSM900/1800 or GSM1900). Funbox. 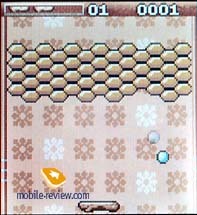 There are 2 pre-installed games in the phone: Hamster Box, Honey Ball. 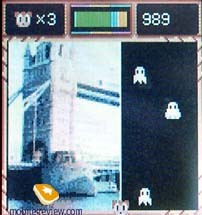 In the first game your mission is to conquer a space and not meet with fling ghosts, at the end of the game you’ll see a picture. 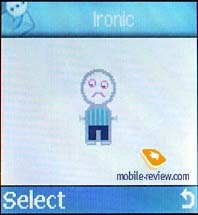 The second game is a kind of Archanoid. Wap-browser in version 1.2.1 can help to download new pictures, melodies and games. The phone supports Java technology and your humble servant was able to download new games, which are much more interesting than pre-installed ones. Connection quality is comparable with any modern phone from Samsung; it’s excellent. Volume level of the loudspeaker is more than sufficient; sometimes you should turn it down. 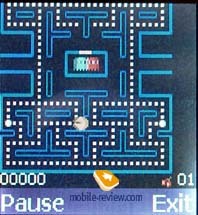 Capabilities of the internal screen are great for the phone of such small dimensions. This display contains much information and vibrant colours, which is one of the best today (in our opinion, of course). 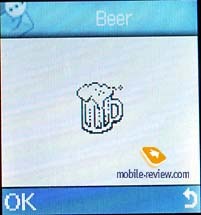 Though S300 and A800 are similar indesign features, they are very different handsets. 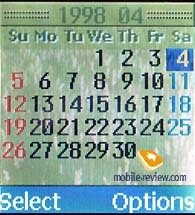 S300 has a dual color screen and high operating time (about 4 days). So, we think that this fashion phone will be in great demand. Besides, the phone has one of loudest polyphonic ringing tones and long operating time in the standby mode (for the phone with two screens). 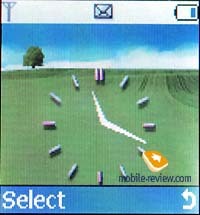 Ringtones types are available here (мр3, 925 Kb). If to say about technological features, the phone is rather controversial. On the one hand, it doesn’t have voice memo, voice dialing, but on the other, it has sufficient memory space to store messages and phone numbers, also, it supports caller groups. GPRS and IR-port availability allows to use S300 as a modem for notebook. A new feature is a possibility to create a SMS message in many languages. The phone is expected to be launched in the end of February. In Russia it will be available in the beginning of March. The price, most likely, will be about 350-400 USD.